Proper dental care at home consists of daily brushing. Just as with humans, dogs need the plaque and biofilm removed from their teeth on a daily basis to avoid dental disease. The vast majority of dogs will accept daily brushing by their owners. 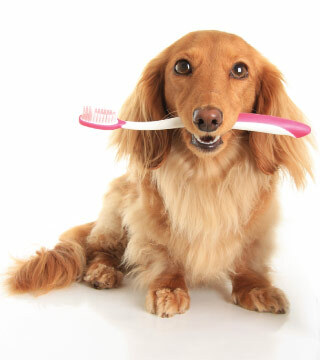 We are here to teach you how to brush your dog's teeth and provide you with the best dog toothbrush and dog toothpaste according to your dog's size and flavor preference. It can be a bonding experience for owners to brush their dog's teeth and the dog may come to really enjoy the process. However, not every dog will tolerate and not every person is willing or able to brush their dog's teeth, we can work with you to find the next best solution for home care. The Veterinary Oral Health Council (VOHC) lists many dog diets and treats that can be helpful if your dog will not tolerate brushing (vohc.org). These approved diets and treats provide some supplemental dental care. However, just as humans require regular dental care to maintain proper dental health, it takes more than a chew toy to properly care for your canine companion's mouth, gums and teeth. During your regular veterinary visits, we will examine your dog's teeth and will show you the obvious lesions that need to be addressed. We are most concerned with signs of gingivitis, broken teeth, periodontal disease and other painful dental and oral lesions. Our doctors may recommend a veterinary supervised dental cleaning. Some people think that dog bad breath is a trait inherent to the canine species. This is a myth that dogs themselves have contributed to over the years through behaviors including drinking from the toilet, eating feces, and self-grooming habits. However, these practices alone do not account for dog bad breath. Dog bad breath is generally a result of the bacteria that live in the infected gum and dental tissue in your dog's mouth. This odor is a sign of progressive dental disease. It will not get better without a thorough veterinary dental cleaning and a proper home care plan. Should you notice any of these symptoms, schedule a veterinary appointment right away. Our veterinarians will develop a customized plan of prevention or treatment based on what is found during the doggie dental exam at your next visit. The dog dental care services provided here at Freeport Veterinary Hospital begin with an examination by one of our veterinarians. If dental issues are found in your dog's mouth, our veterinarian will explain the situation to you and recommend the appropriate dental procedure. During this procedure, once your dog is sedated, our veterinarians are able to conduct a more thorough exam including visualizing the entire oral cavity and throat area, probing gingival pockets to assess periodontal disease and dental x-rays of the entire mouth. It is important to remember that half of the tooth is under the gum line. Therefore, it is imperative that x-rays are performed to compete assessment of the tooth. Quite often a tooth may look completely normal but the roots may be abscessed and can be a great source of pain for your dog. We utilize all the tools necessary to make sure your dog is completely free of dental disease and pain. General anesthesia, which is necessary in all cases for us to do a thorough dental examination and professional cleaning. We use only the safest anesthesia protocols and human quality products. Your dog will be continually monitored during the entire procedure and post procedure for the safest and most comfortable experience. A complete dental exam will be performed before we begin any dental procedure. Dental radiographs are taken at this time. Dental radiology allows our veterinarians to view the internal anatomy of the teeth including the roots and surrounding bone. A thorough dental chart is used to record the dental health of your pet, and any procedures done during the dental cleaning. Ultrasonic and hand scaling to remove plaque and tartar above and below the gum line. A thorough scaling below the gum line is critical to the success of any dental cleaning, as this is where illness-causing bacteria hide. Polishing to smooth the surface of the teeth after scaling, making them resistant to additional plaque formation. Flushing to remove dislodged tartar, plaque and bacteria from the mouth. If it is determined that an infected tooth requires extraction, or there is a problem with the gums that must be addressed, then and only then will oral surgery be recommended. Our dog dental facility allows our veterinarians to precisely perform whatever oral surgical procedure is necessary, in order to help your canine companion live, or regain a healthy and happy quality of life. Periodontal disease in dogs is the most common clinical condition occurring in adult canines. By three years of age, most dogs have some evidence of periodontal disease. Unfortunately, other than bad breath, there are few signs of periodontal disease in dogs evident to dog owners and professional diagnosis often comes too late to prevent extensive damage. Periodontal disease in dogs, if left untreated, will lead to infected, non viable teeth and significant dental pain. However we cannot overstate the fact that periodontal disease in dogs is fully preventable. The way to successfully do so is to schedule semi-annual dog dental exams and dog teeth cleaning appointments with your veterinary dog dentist. By doing so, you are ensuring that your canine companion remains at a low risk for developing periodontal disease. Scheduling an appointment with one of our veterinarians is as easy as picking up the phone, or sending us an email. Our veterinary staff is here to help make your dog's dentistry appointment easy for you, while making it as painless and pleasant as possible for your canine companion.